With my system reviews I try to look at interesting obscure systems that the Video Game Critic will be unlikely to cover. 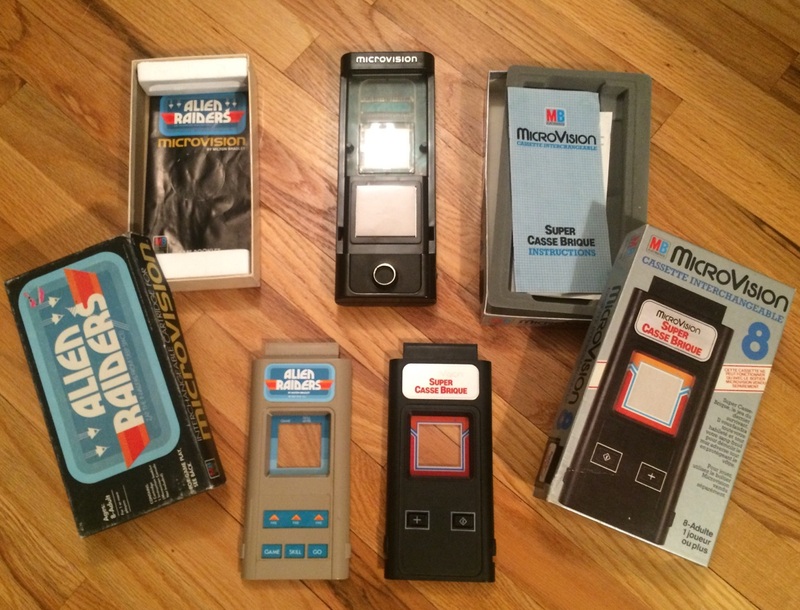 This article features the Microvision, a 1979 handheld system made by Milton Bradley. While I’m an avid collector of handheld systems, I didn’t own this system until 2013. From a historical perspective the Microvision is a landmark system, generally regarded as the first handheld video game system. Despite that distinction the system didn't sell very well and now exists as a little-known relic to retro gamers. While there's a fair amount of information regarding the system around the internet, I struggled to find any descriptions or reviews of the system’s 12 released games. Now that I’ve compiled a complete Microvision library I’m hoping to fill in that void and provide the Microvision with some of the love that it rightfully deserves. The Microvision is a primitive handheld featuring a 2” LCD screen, and a 16x16 display with each pixel looking like a black block. The system was designed by Jay Smith who later designed the Vectrex. The games come on swappable faceplates that snap onto the front of the system. Each faceplate has a plastic window that exposes the underlying screen and buttons that register on a touch pad underneath (on the unit itself). Some Microvision games use overlays to compensate for the lack of graphics, as seen with titles like Connect Four and Vegas Slots. Interestingly, the Microvision unit has no built-in CPU, but a 0.1 MHz CPU was build into each individual game cartridge. Microvision systems are prone to technical issues, particularly a deterioration of the screen known as "screen rot", making it harder to find a working unit. Anecdotally, some believe the European systems and the later U.S. models are less prone to issues than the early U.S. systems. To differentiate the two U.S. systems, look inside the battery compartment. Early models have connections for two 9V batteries, while later models have a connection for one battery and an empty “storage” space. I obtained a later U.S. model from 1980 and have had no issues. From today's perspective the Microvision is primarily a collector's item rather than a retro gaming system. The games are not as awful as you might expect from a 1979 handheld that can only display 16x16 pixels, but there are few (if any) compelling titles. A few games however managed to occupy my time for over an hour - quite a feat considering today's short attention spans. 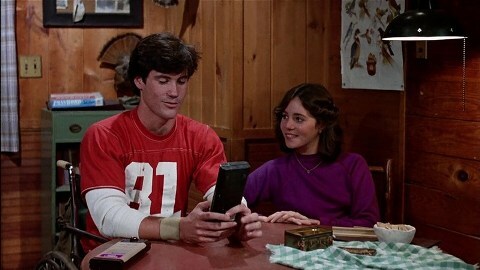 And there is always the historical charm that comes from playing a portable released 40 years ago. The Microvision had 11 games released in the United States (most of which were also released in Europe), and 1 game released exclusively in Europe (Super Blockbuster). None of the U.S. titles are exceedingly rare, so it's feasible to collect the whole set. Super Blockbuster is the rarest game by far, especially for U.S. gamers (took me 3 years). Microvision prices are very reasonable, as a system with several games should run you about $50 on eBay. Individual games range from about $5 to $20 depending on condition and rarity, although Super Blockbuster can sell for much more. These prices have remained fairly consistent for the past several years. In total, the Microvision has 12 games. There are U.S. and European versions of the systems and cartridges, but they all should be interchangeable. The three main differences between U.S. and European cartridges are the buttons, the packaging, and the game titles. The U.S. carts have membrane-style buttons while the European games have plastic buttons. Most gamers swear the European buttons are better, but I find them stiff and harder to press. Granted, the U.S. buttons can be tough to use as well. In terms of packaging the European boxes are slightly larger, use less color, and employ a numbering system (e.g., Pinball is cartridge #4 in Europe but no numbering is used on the U.S. version). I strongly prefer the U.S. packaging as it's more visually striking. As for the game titles, don’t be fooled by the numerous variants. Shooting Star for example was a game released in Europe but it is identical to the U.S. game Phaser Strike. Likewise, Connect Four in Italy was called Forza 4 (not to be confused with the Xbox 360 racer). The same game is known as Puissance 4 in France. My copy of Super Blockbuster is the French version entitled Super Casse Brique. Certain games can have three or more name variants. Not only is this confusing for new collectors, but it makes the Microvision library appear much larger than 12 games. Turning now to the individual game reviews, I've ordered them from best-to-worst based on my personal opinion. Generally, my idea of "best" correlates to fun factor and how long the game held my interest. I used an A to F grading system based on the Video Game Critic's scale, scoring each game based on comparison to the rest of the Microvision library (so an "A" game is only an A in comparison to other Microvision games). Games denoted by a (*) after their name mean "Instruction Manual Strongly Recommended". Due to the rudimentary nature of the games, certain ones are very difficult to figure out (sometimes impossible) without a manual. Fortunately, manuals can often be found online in PDF form in case your game didn't come with one. 1. Super Blockbuster (A): This is a Breakout clone and a pretty good one at that, considering the limitations of this system. Released in 1982, Super Blockbuster was the final Microvision game, sold only in Europe. It was the sequel to the Microvision pack-in title Block Buster. While Block Buster was your standard Breakout knockoff, Super Blockbuster added a new wrinkle to the formula. You still have your usual rows on the top of the screen to destroy, but there's also a row on the bottom that you must protect. There are no lives and you cannot lose a ball. Instead your game ends when the bottom row is destroyed. It's a lot more fun than Block Buster and controls better too. If there’s a downside, it’s that this is a Europe-only cartridge, and I prefer the button style of the U.S. games. Regardless, this is as good as it gets on the Microvision - the best game on the system. 2. Alien Raiders* (A-): Here we have the peak of arcade action on the Microvision. Despite the name this is not a Space Invaders clone. No, the Microvision probably couldn't handle that game due to its limited resolution. Still, Alien Raiders is a very good arcade-style shooter - at least by Microvision standards. You control a ship (or laser) on the left side of the screen with alien raiders approaching from the right. Your goal is to shoot enemies before they reach your side and "land", at which point it's game over. But there's more to it than just shooting everything in sight. Your ship attacks with a laser beam rather than bullets, and the laser beam will only hit the raiders when adjusted to the perfect length using the control knob. It's easy to come up short or overshoot a raider, so there is strategy and skill involved. The speed and intensity ratchets up the longer you play. 3. Connect Four (B+): Here's one of the very few official standalone video game versions of Connect Four ever released (recall Milton Bradley also made the board game). You can play against the computer or try the two-player mode where you hand the console back and forth between turns. The screen is big enough to fit a whole Connect Four board, so it's just like the real thing. There's nothing special about it, but it is what it claims to be. The only notable flaw is that sometimes it can be hard to differentiate your pieces from your opponent's - especially as the board fills up. I enjoyed Connect Four as a kid so much that I was the Connect Four champion in second grade! Being my life's greatest achievement, that may play a role in its high ranking here. 4. Mindbuster* (B): Mindbuster is a hard-to-explain puzzle game that’s most similar to Lights Out (the Tiger handheld, also released on the Game.com portable). Mindbuster has two game modes. Both employ a grid of lights, and pressing one square on the grid influences those around it. In Rings mode you try to surround small black squares with large ones. In Lights Out mode you attempt to eliminate all the squares to clear the screen. Both modes begin with the game randomly generating the puzzle, and you try to reach your goal in as few moves as possible. The manual indicates that you can configure your own puzzles as well, but I couldn’t figure out how. I found Lights Out mode too easy and Rings mode too challenging. It would be nice if there were a middle ground. I don’t think I ever actually solved a puzzle in Rings mode, but had fun trying. 5. Sea Duel* (B-): The complexity of this game caught me off-guard. This is by far the deepest game on the Microvision - and in more ways than one. It's a turn-based strategy game set on the open seas, with one player controlling a submarine and the other a navy destroyer. You can battle a friend or the CPU. 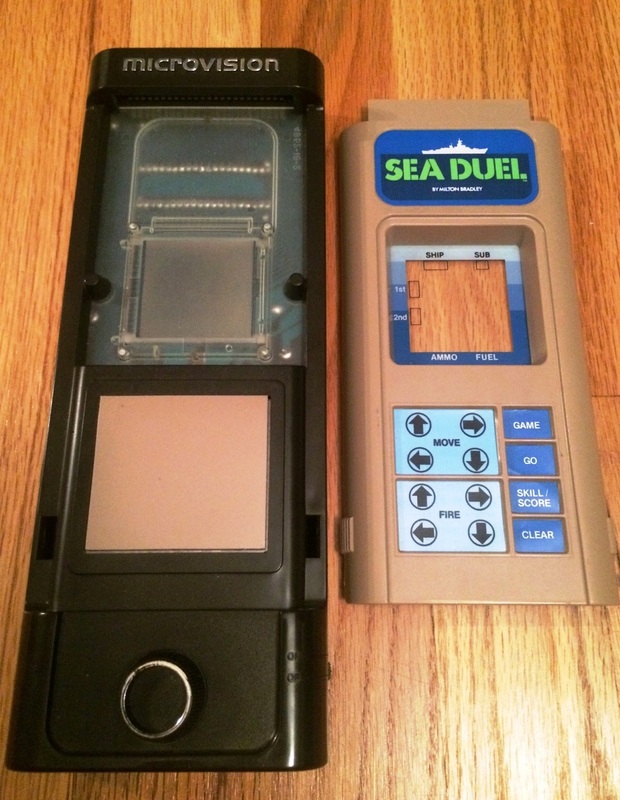 Sea Duel is like a more active version of Battleship. Each player only has one ship, which you secretly move around the board, and you never know exactly where your opponent will be. Instead you try to predict their movements and fire a shot. Once both sides have locked-in their moves, the action plays out simultaneously on screen. Milton Bradley even has a fancy name for this -- "Multiple Simultaneous Movement". During this phase you watch both ships move to the selected locations and shots are exchanged. There is a certain amount of strategy as you try to outsmart your opponent with your moves and correctly predict where to fire. Many Microvision enthusiasts consider Sea Duel the best game for the system, but the pace is a bit too plodding for my tastes. That said, with a worthy human opponent, I could see some people rating this game a full letter grade higher. 6. Block Buster (B-): Block Buster is essentially a dumbed-down version of Breakout for the Microvision. It was packaged with every new Microvision system back in the day, meaning it's common and easy to find. I originally gave this game an A-, but after playing the superior Super Blockbuster it became much harder to tolerate its imprecise controls and choppy ball movement. On the hardest setting (fast speed and one-pixel paddle) the game is unplayable. On the easiest setting (slow speed and larger three-pixel paddle) the game is still challenging, but becomes somewhat addictive in short spurts. You can choose from 1-9 balls, and it makes sense to choose 9 to compensate for some of the cheap losses. Just beating the first level is an accomplishment that took me about an hour's worth of retries, with a “just one more game” mentality the whole time. After that though, I had little interest in replaying it again. My addiction may have been short-lived, but that’s still enough to earn a B- in Microvision world. 7. Baseball* (C): I fully expected this game to be awful. How do you play baseball on a 16x16 screen? But it’s actually not half bad for playing a quick game or two. It's closer to Home Run Derby than real baseball because there's no fielding. The ball comes from the pitcher's mound and you use the control knob to swing your bat to smack the ball. Depending on where and how far it flies you either make an out or hit a single, double, triple, or home run. You get three outs per inning and go through 9 innings of this. Eventually it gets boring as it's too easy to score once you get past the learning curve. The two player mode seems to have potential but I wasn't able to try it. An instruction manual is essential with this game, because it is very difficult to figure out the swing mechanism without it. 8. Bowling (C-): This game is decent for a few rounds, but it's very simplistic and gets boring quickly - even with two players. There are ten pins at the top of the screen and your ball moves back and forth across the bottom. Timing it just right, you press a button to release the ball, sending it rolling on a straight line toward the pins. You do that over and over again. Woohoo..
9. Cosmic Hunter* (D+): As one of the games released later for the system, this one is harder to find. If you can't track it down however you can rest assured you're not missing much. In Cosmic Hunter you're supposed to be a hunter on an alien planet. You’re represented by a dot and you chase around another dot, which is an alien (obviously). Here's the thing: you can only catch the alien from 2 pixels away. If you're 3 pixels away you're too far, and if you're one pixel away the alien eats you. There is a bit of strategy involved in terms of chasing the alien on the maze-like playing field and cornering it for the capture. You have to maneuver yourself and press the capture button with perfect timing. Cosmic Hunter gets credit for creativity, but once you get the hang of it the gameplay becomes tedious and boring. It might be more exciting if there were multiple aliens on the screen at a time, but as far as I can tell that never happens. 10. Vegas Slots (D): Now here's a Microvision game your Great Uncle Fred would love. It reminds me of those lame $10 slot and poker handheld games you used to see old people sitting in their recliner playing for hours on end. I never understood the point of simulated gambling, and I can't imagine one more boring than slots. Once you take the thrill of winning money out of it you're left with some sort of boring matching game governed by pure chance. That being said, if you want a slot simulator this game works as advertised. The graphics are crude but get the job done. The "highlight" (if we can call it that) is the two-player mode, which incorporates the concepts of risking your bankroll and banking your winnings to add some strategy. 11. Star Trek Phaser Strike [aka Phaser Strike] (D-): This game is pointless. You control a gun (your ship?) at the bottom of the screen as sets of pixels (enemy ships?) fly horizontally across the top of the screen. You simply aim and time your shots properly to hit the flying pixels. That's it... shoot a moving pixel for points. Only one "enemy" appears at a time, which doesn't exactly get the adrenaline pumping. There’s nothing fun here. What a terrible waste of the Star Trek license! Just stick to Alien Raiders for better shooting action. 12. Pinball (F): The lamest, dumbest Microvision game of them all. It’s too bad because Pinball just sounds like a game that could fit this system well. Unlike normal pinball you do not get two flippers. Instead you have a paddle at the bottom of the screen just like Breakout and Block Buster. The playfield contains just four measly dots you pretend to be bumpers, and that’s your entire pinball machine. You move your paddle along the bottom of the screen to hit the bouncing ball and hope it hits the bumpers, scoring one point per bumper hit. The combination of boring gameplay and lost potential annoys me to no end. Some people actually like this game, but I can’t see any reason to play this over the two Block Buster games. I find Pinball incredibly dumb and the worst the Microvision has to offer. I hope this information is helpful (or at least informative) to fellow gamers of the world interested in the Microvision. I’m glad that I bought one if for no other reason than its place in history as the first handheld system. I also like its large, attractive boxes, which display well. Curious retro gamers should give the Microvision a shot. At the very least I think it deserves more attention than it's received thus far. If anyone feels different about any of these games or has any questions or anything to add, please feel free-- I'd be interested to hear! Follow discussion in Microvision Thread in VGC Forum. Follow discussion in Microvision Thread in VGC Forum. As seen in the classic film Friday the 13th Part 2!